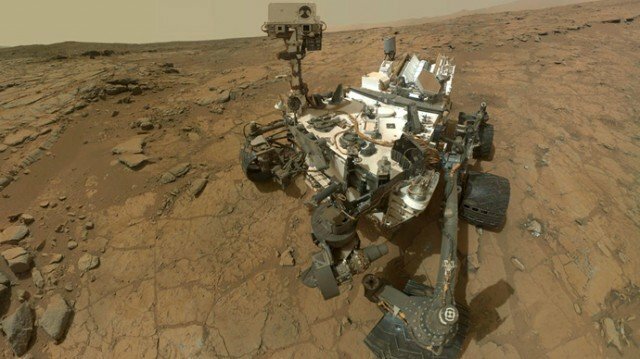 According to an analysis done onboard NASA’s Curiosity rover, there is a surprising amount of water bound up in the soil of Mars. When it heated a small pinch of dirt scooped up from the ground, the most abundant vapor detected was H2O. Curiosity researcher Laurie Leshin and colleagues tell Science Magazine that Mars’ dusty red covering holds about 2% by weight of water. This could be a useful resource for future astronauts, they say. “If you think about a cubic foot of this dirt and you just heat it a little bit – a few hundred degrees – you’ll actually get off about two pints of water – like two water bottles you’d take to the gym,” Dr. Laurie Leshin explained. The revelation about the amount of water chemically bound into the fine-grained particles of the soil is just one nugget of information to come from a series of five papers in the respected journal describing the early exploits of the rover. Some of this data has been reported previously at science meetings and in NASA press conferences, but the formal write-up gives an opportunity for the wider research community to examine the detail.